This craftily constructed and well-balanced exhibition opens with a room-size installation, Asylum 2014 by Eva Kotatkova, based on her visits to a psychiatric hospital in Prague. The exhibition is sprinkled with survivor tales, faded book illustrations and intriguing constructions that sometimes look uncannily like hair massagers. It is a veritable memory game of intriguing objects, an ‘archive of inner visions’. In old black-and-white footage it edges us towards the story of Geel, known as a ‘colony of the mad’, the revolutionary town in Belgium that has been integrating people with distress into the local community for many years. 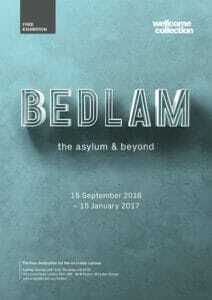 It ends with a magical look at the asylum of the future in the last room – constructed by the vacuum cleaner and Hannah Hull (Madlove: a designer asylum) together with lots of people with experience of the mental health system. It looks bright, cheerful and hopeful, and a place of true asylum with libraries, bright cafes and everyone going at their own pace. I’ve long thought that the concept of ‘asylum’ in its truest sense was thrown out when the large Victorian asylums were closed. Initiatives such as Philadelphia Association/Soteria houses and the crisis houses that appear patchily through the UK (notably Drayton Park in London as well as Maytree, a haven for those with suicidal thoughts, also in London) are too scantily spread and available to too few. Economics is always at the bottom of plans like ‘care’ in the community (which replaced asylums). The asylums were not all bad, and when they worked, they provided a therapeutic place for the distressed to recover, work (admittedly for a pittance), garden and just be. As this exhibition shows, there were huge differences in the quality of the asylum experience. I’m an alumna of the old Victorian asylum system (the Towers, Leicester, and the Warneford, Oxford – the latter still going and once named the Oxford Lunatic Asylum) and also a newer version, the Maudsley in London. On balance the experience was probably preferable to being on a psychiatric ward of a general hospital. The non-London places had gorgeous grounds, and well developed Occupational Therapy departments (essential). I shall remain silent on the ‘treatment’. The first exhibition rooms take one past fascinating early documents around the subject of Bedlam, which started as “Bethlem at St Botolph without Bishopsgate”. First a refuge for anyone in need (non-medical) it began to specialise in the ‘distracted’ ‘madde’ or ‘lunaticke’. Extrapolated to now, these were a mixture of acquired and organic conditions. There was a presumption that it was possible to recover from the nonorganic conditions. Past poems about Bedlam in bound books are in the central room – designed a little like Der Narrenturm, a round madhouse in Austria of the eighteenth-century, with compelling art of the ‘alienist’ who ran the asylum by Bedlam inmate Louis Wain, and also by Strindberg and Nijinsky. The eighteenth and nineteenth centuries saw many madhouses (lunatic asylums) built, both private and County, containing the whole spectrum of ‘treatment’ from purging, emetics, and bloodletting to restraining in straightjackets and handcuffs and being subject to Galvanic Bands. Conditions were bad. Bethlem at least abolished restraints in the nineteenth century and tried to concentrate on ‘moral ‘ therapy (which could be construed as today’s social psychiatry). Tuke in York was a pioneer of this – basically kindness, occupation and a good diet. 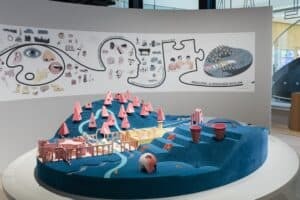 Dotted around the exhibition are audio points – with a soundtrack created by Core Arts, an organisation that supports wellbeing through creativity. Having gone round the exhibition from the end to the beginning the first time round, I went in at the beginning when I went a second time. Both ways round make sense! The final rooms are crowded with twentieth and twenty-first century artistic and sociological takes on the whole thorny business – for example lovely pictures by talented artist William Kurulek What am I? Who am I? Why am I? A telling copy of the Mental Health Act of 1930 is displayed – when mental ‘illness’ was seen as a temporary condition that most could recover from. This idea got lost somewhere as the century rolled on. Some stunning footage of Netherne hospital – where patients would stay for a very long time – has been woven into a film; 95,000 art works from Netherne – collected as the Adamson collection – are now lost, but 5,000 survive. Hideous stories emerge from the patients. One woman felt she would go in to the hospital and not live very long. In 1960 a lot of the patients had just five possessions including a toothbrush. One of the abusive ideas in psychiatry of then (along with using insulin shock, lobotomy, ECT and all the other delights as ‘treatment’) was that mental distress was a ‘sepsis’ and so patients had organs removed such as tonsils, teeth, spleen and appendix. Chillingly there were ‘ward teeth’ shared by all the patients when it came to meal times…The art of J J Beegan (created with charred matchsticks on toilet paper) while he was there ended up in a Raw Vision Art Brut exhibition eventually, with a price tag. This tradition still lives – my friend made a tiny horse from tissue, a paper wrapping and coffee-stain while in an acute setting with nothing to do and no resources. Dotted around are telling pieces of art – including just a bottle of Largactyl in a glass case (it’s a very powerful ‘antipsychotic’, a very strong tranquilliser), a sound piece about ECT facing a poem by Sylvia Plath about her experience and terrifying black and white telly ads for various tranquillisers (turmoil to tranquillity being the message). There’s a piece on Basaglia and the ‘60s anti-asylum movement in Italy and testimonies of those who lived in late twentieth-century asylums with very little to do and work which was paid 15p an hour. Enoch Powell in 1961 abolished the asylum as it was then, and replaced it with ‘care’ in the community. Ending with how I began – with madlove’s vision of a true and valid asylum space, I feel that this exhibition is truly worth seeing. There is no manipulation. Facts are stated, not spun. There is no othering or outsidering, as is so often the case. There is no sentimentality either. There are fascinating books and artifacts and along with the exhibition come varying talks on the future of the idea of asylum, and a chunky and information- packed book called This Way Madness Lies by co-curator Mike Jay, published by Thames and Hudson and the Wellcome Collection..
More information about the exhibition can be found at www.wellcomecollection.org and the complementary shows at Bethlem itself, now in Kent. The exhibition was co-curated by Barbara Rodriguez Munoz. Polly Mortimer is librarian at the Minster Centre, London and library consultant at the British Psychotherapy Foundation.